Thank you very much you people doing very helpful job for needy people.If i got my match on your site i will be very thankful to you. Just to say your organisation is EXCELLENT! I am really appreciate this site & happy to join this coz here I found my partner here according to my preference. In todays scenario people need this to make us the relationship globally. 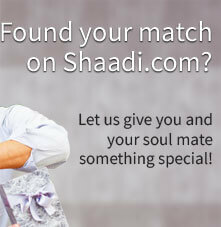 Shaadi.com is giving wonderful service to millions of prospective brides& grooms. Infact, my brother got married and he is happy, through shaadi.com. Hats off! A special thank you for the quality service that you have provided.Your website is a blessing for people around the world. Please accept my sincere thank you for the wonderful and principled service that the Shaadi team has provided me with. Bhagwan bless the manager and team for the homes that you build. You are a quality brand with good service delivery. The service extended by Shaadi.com was really great. I registered the particulars of my daughter Sravanthi with you and the responses received were really great and I am really thankful for the same. I once again thank you for all the excellent service extended to us. I am very much impressed by the presentation of the the website and different options available to select life partner.